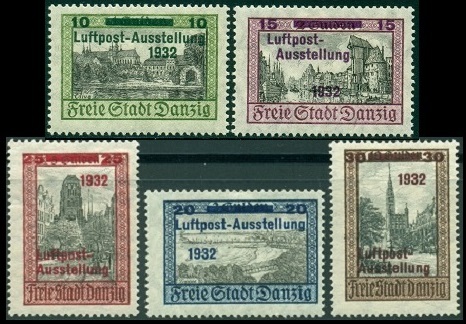 For the Freistadt Danzig (Free City of Danzig), the period from 1930 to 1935 was filled with great uncertainty. The Great Depression, which began in late 1929, continued into the early part of the decade. As a result of ongoing economic hardship, coupled with ethnic resentment, the local NAZI Party was able to take full control of the Danzig legislature in June 1933. After the takeover of the local government, political opposition was suppressed, sometimes violently. The persecution and discrimination against the Jewish population, about 2% of the total population of Danzig, also began at this time, causing many of them to flee to neighboring countries. The eleven overprinted definitive postage stamps shown above (Mi. #220-230, Sc. 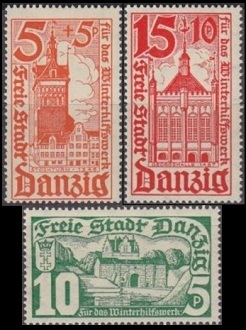 #200-210) were issued on November 15, 1930 to celebrate the 10th Anniversary of the Establishment of the Freistadt Danzig. The overprint reads "1920 / 15. November / 1930". This is a pricey set. One should be very careful when buying them, as forgeries do exist. The five overprinted and surcharged Gulden denomination stamps shown above (Mi. #231-35, Sc. #C31-35) were issued on July 11, 1932 for the International Air Post (Philatelic) Exhibition. These stamps were sold for double the surcharged values, with the amount going to the philatelic exhibition. The 7 Pf. denomination Coat of Arms type definitive stamp shown above (Mi. #236, Sc. #171) was issued on April 27, 1933. These new stamps were all printed on white paper, and they are perforated 14. The three surcharged definitive postage stamps shown above (Mi. #237-39, Sc. #B9-11) were issued on January 15, 1934 to raise money for Winter Relief Charities. The overprint "W. H. W" stands for the German word "Winterhilfswerke". Only 13,000 sets were sold, making them rather scarce today. Counterfeits do exist. 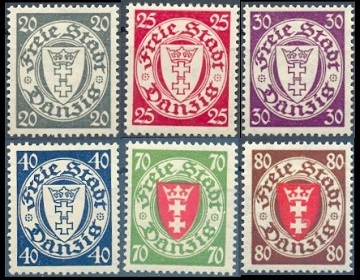 The five re-valued Coat of Arms type definitive postage stamps shown above (Mi. #240-42, Sc. #211-15) were issued between December 1934 and December 1936, to satisfy new postal rate increases. The 8 Pf. re-valuations come in three different colors, as shown above. The two Coat of Arms type definitive stamps shown above (Mi. #243-44, Sc. #185, #189) were issued on April 15, 1935. These new stamps were all printed on white paper, and they are perforated 14. 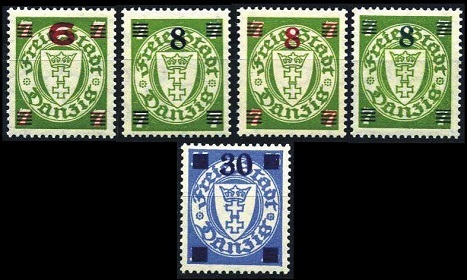 The six Coat of Arms type definitive stamps shown above (Mi. #245-50, Sc. 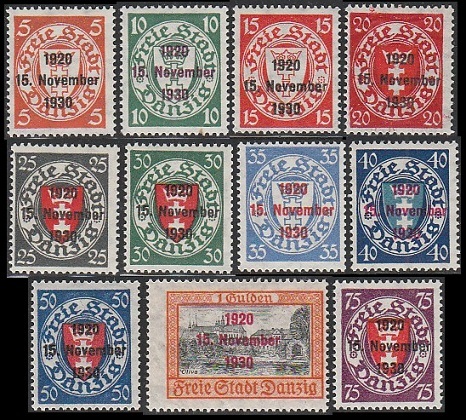 #178, #180, #182, #186, #190, #192) were issued between June and September 1935. These new definitive stamps were also printed on white paper, and they are perforated 14. 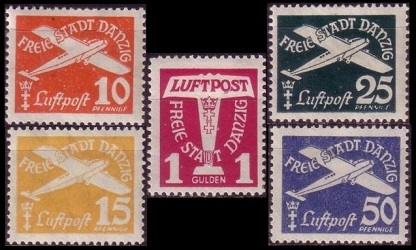 The five new airmail stamps shown above (Mi. #251-55, Sc. #C36-40) were issued on October 24, 1935. These new designs featured stylized monoplanes. The second in the annual series of Winter Relief charity stamps, shown above (Mi. #256-58, Sc. #B12-14), were issued on December 16, 1935. The designs feature the Stock Tower, George Hall, and the City Gate, all in Danzig.